We connect simplicity AND complexity. Our focus is on integrating emerging new technology and the best of contemporary reality. We believe in the power of planning and predicting – and also in embracing new concepts because they can be based on the solid ground of the viable present. This belief leads us to set up procedures and operations which increase the predictability and reliability of real life. It is our opinion that asset management is best optimized with the integration of excellent IT knowledge and strategic visions. Integrating and optimizing today’s challenges into the prosperous trio of IT, people, and business – this is what we do best. The company was established in 2010 and employs more than 20 professionals. 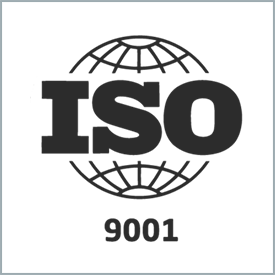 We have service expertise in planning, administrating, consulting and implementation of information solutions. The team has more than 20 years of experience in asset management projects in Slovenia, SE Europe and the Middle East. We are Troia. Managing your optimized changes. Our company is managed by Primož Sevčnikar and Rok Dolinšek, who have a combined experience of more than 15 years working with Maximo and other related EAM software. We have a policy of recruiting recognized experts in the fields of engineering, asset management and business, all members of the TROIA team are client-facing, self-starters with exceptional written and verbal communication skills. We are constantly looking for motivated,talented individuals to join our team. If you are looking for an opportunity with an ambitious,fast-growing company at the leading edge of Asset Management Consultancy, then contact us today with your CV by emailing jobs@troia.si. We work with selected leading partners to obtain additional expertise and provide other services when required. To find out more about becoming our partner, please contact us. We actively collaborate with IBM to deliver significant value for our clients through innovative solutions. We are one of the best specialists when it comes to the use and implementation of IBM's buiness software, both in Slovenia and abroad. Our IT professionals excel in the area of information-based management of modern IT environments and resources. We are considered to be one of the most reliable business partners of IBM Corporation in the region of Central and Eastern Europe as we have held the title of IBM Advanced Business Partner for several years in a row. The mentioned partner status lets customers know that our business professionals can tackle any challenge. Having demonstrated superior skills and market success, we have been awarded (AAA) business partner status. In the field which the global technology giant calls IBM Cloud & Smarter Infrastructure we achieved two prestigious partner certifications: "SmartCloud Control Desk Solution – Gold" and "SmartCloud Control Desk Service Request Management - Gold". The first certificate is only held by three other companies in the world, while only five others master the second. These solutions enable enterprises to comprehensively manage IT services and IT resources (physical and virtual) and deliver advanced user support. We have demonstrated that we genuinely control the area of resource management by receiving another certificate: "IBM Maximo Asset Management - Gold". We deliver a wide variety of implementations and integrations of software asset management to customers – on-premises or in the cloud (Software as a Service - SaaS). These are tailor-made solutions for every business requirement. Such an approach provides today's so sought-after business agility coupled with modern business models. By adding another certificate - "Tivoli Application Dependency Discovery Manager - Bronze" to our IBM Tivoli certificates tally, we proved our knowledge in this field of expertise – asset management. We are proud to receive ISO 9001 certification, an internationally recognized standard that ensures that our products and services meet the needs of our clients through an effective quality management system. 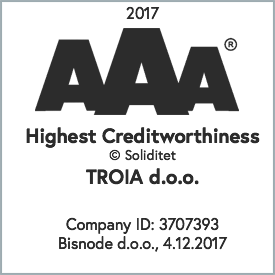 We are also Bisnode AAA certified, which means that the business entity fulfills the international standard of excellence in creditworthiness and belongs to the highest order of excellence in creditworthiness in Slovenia. We beleive that today’s challenges can not only be handled by emerging and innovative new technologies, but mostly by people who can connect simplicity and complexity.